For the sweet relation you share with your brothers and dear ones, send this Ecstatic Gift of Tempting Cadbury Chocolates Hamper which comes with a free Rakhi, Roli Tilak and Chawal for the sacred Raksha Bandhan. The Hamper consists of Cadbury Temptation, Cadbury Dairy Milk Silk, Cadbury Dairy Milk Crackle, Cadbury Dairy Milk Fruits N Nuts and Cadbury Dairy Milk. The formation of the Rakhi may comes with alteration. 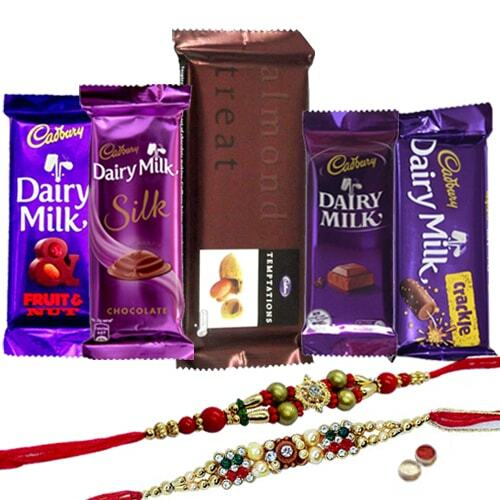 Cadburys Chocolates Hamper (Cadbury Dairy Milk Silk, Cadbury Dairy Milk Fruits Nuts, Cadbury Dairy Milk Crackle, Temptation and Cadbury Dairy Milk) with 1 Rakhi and Free Roli Tilak and Chawal. Cadburys Chocolates Hamper (Cadbury Dairy Milk Silk, Cadbury Dairy Milk Fruits Nuts, Cadbury Dairy Milk Crackle, Temptation and Cadbury Dairy Milk) with 2 Rakhi and Free Roli Tilak and Chawal. Cadburys Chocolates Hamper (Cadbury Dairy Milk Silk, Cadbury Dairy Milk Fruits Nuts, Cadbury Dairy Milk Crackle, Temptation and Cadbury Dairy Milk) with 3 Rakhi and Free Roli Tilak and Chawal. Cadburys Chocolates Hamper (Cadbury Dairy Milk Silk, Cadbury Dairy Milk Fruits Nuts, Cadbury Dairy Milk Crackle, Temptation and Cadbury Dairy Milk) with 4 Rakhi and Free Roli Tilak and Chawal. Cadburys Chocolates Hamper (Cadbury Dairy Milk Silk, Cadbury Dairy Milk Fruits Nuts, Cadbury Dairy Milk Crackle, Temptation and Cadbury Dairy Milk) with 5 Rakhi and Free Roli Tilak and Chawal. Cadburys Chocolates Hamper (Cadbury Dairy Milk Silk, Cadbury Dairy Milk Fruits Nuts, Cadbury Dairy Milk Crackle, Temptation and Cadbury Dairy Milk) with 6 Rakhi and Free Roli Tilak and Chawal.